Mr. Hammonds is a founding partner of the Law Offices of Hammonds & Sills, located in Baton Rouge and Monroe, which, as of July 1, 2012, became Hammonds, Sills, Adkins & Guice, LLP. Mr. Hammonds received his B.S. degree in 1976 and J.D. degree in 1978 from Louisiana State University. 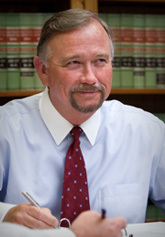 Since 1978, he has practiced almost exclusively in the field of public school law. He serves as General Counsel to the Louisiana School Boards Association. He has represented school boards and their staffs throughout the state in all kinds of school law litigation, including desegregation cases, employment discrimination cases, special education cases, and administrative hearings. Mr. Hammonds has extensive experience in all federal district courts in the state and has argued many cases to the U.S. Fifth Circuit Court of Appeals. He is also admitted to practice before the United States Supreme Court. He is a member of the Baton Rouge and Louisiana State Bar Associations, the National School Boards Association Council of School Attorneys, and serves as President of the Louisiana School Attorneys Association. Mr. Hammonds has been a frequent guest lecturer at state universities and education seminars and has provided hundreds of training sessions to school board members, superintendents, principals, teachers, and others on issues related to the performance of their duties.